If you just picked up your iPhone 5s, you may be itching to record some slow-motion video. (I know I was.) But due to the way Apple's slow-motion feature is implemented, sharing your brilliance with the world may take a few extra steps. Despite what you may think, Apple's slo-mo mode doesn't record in slow motion at all. Instead, it records in real-time, capturing more frames of motion than your eye can perceive. Your average online video is displayed at 30 frames a second. 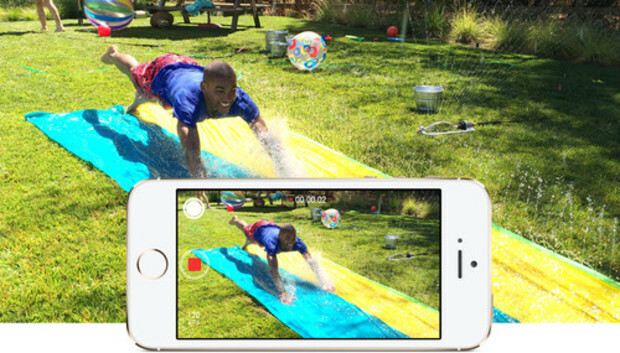 The iPhone 5s camera takes four times that number, capturing 120fps (frames per second); as a result, 1/4th of a second has the same amount of frames that a regular second of video would have. Played at its normal speed, 120 frames a second is awesome for filming things like sports, as you can see moves and plays more clearly. But for most, the fun comes when you slow it down. Apple has built software into the Camera and Photos apps that let you automatically slow a portion of your 120fps video so that it displays at 30fps--and make look really cool in the process, too. Unfortunately, Apple's Slo-Mo tool only applies to clips that the Camera or Photos app exports--and the only way you can currently do that is through the Share sheet, which only supports YouTube, Facebook, and Vimeo. Try and upload a video to a third-party app like Instagram, and all you can post is your 120fps source video. It's possible that apps like Instagram may be able to upload exported video by updating their code, though as I haven't looked at the developer documentation, I'm not sure. But you don't have to wait for your favorite developer to post some fancy slo-mo video: Here are a few tips on how to upload slo-mo video to your third-party apps. So far, I've discovered two ways to do this: One just uses tools on your iPhone itself, and one requires a second iOS device. JUST USE YOUR iPHONE: To force your iPhone to export a slo-mo clip, we're going to use the oldest trick in the sharing book: emailing it to ourselves. Open the clip in question, make sure the slow-motion has been adjusted where you want it to be, then tap the Share sheet. Tap Mail, and your video will compress and attach to an email message. Send the email to yourself. When you receive it on the other end, tap the video to download it, then save it to your camera roll by tapping the Share button and Save Video. From there, you can upload the video to any third-party service--Instagram included. This method works, but comes at the expense of compressing your beautiful HD video into something not necessarily as nice. But there's another way. USE ANOTHER iOS DEVICE: Currently, your iPhone will export slo-mo video to any service listed on its Share sheet. That means you can send an iMessage to yourself, upload video to a Shared Stream, or ping for an AirDrop. You might think: "Wait, why am I using email if I can just send myself an iMessage or a Shared Stream?" For some reason, Apple has prevented this--send an iMessage and it displays at regular speed on an iPhone 5s (but weirdly, it will display in slo-mo on any other device); send a Shared Stream video, and it displays in slo-mo, but there's no way to download it from the Photos app to your Camera Roll (presumably because iOS assumes you already have the video). However, you can download videos from either iMessage or Shared Streams on a different iOS device--and you can even AirDrop the exported slo-mo video. As such, if you have an iPad or old iPhone around, this is the time to use it. Just use the Share sheet to send your slo-mo video to your iPhone, iPod touch, or iPad via iMessage, Shared Streams, or AirDrop. From there, you can post to Instagram or another third-party app from your second device. Yes, you're going to run into the same problem downloading clips to your computer. The good news is that iMovie, Final Cut Pro X, and most other major movie-editing software have time-slowing modes--it just means that you have to import your clips there first. Will Apple create better export tools for Slo-Mo mode in the future? (Will it perhaps let you export your clips to iMovie for iOS?) We can only hope. But in the meantime, these tricks can hopefully get you posting ridiculous slo-mo clips on Instagram in no time.